DFDL Singapore attracts Duane Morris & Selvam LLP Bangladesh legal market expert. 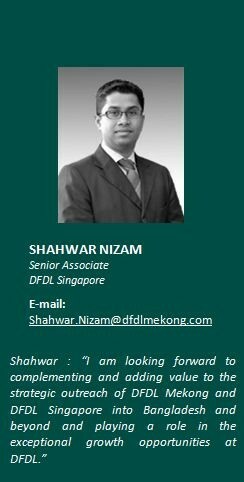 We are pleased to announce that Mr. Shahwar Nizam has joined DFDL Singapore as a Senior Adviser. Shahwar has more than 9 years of legal experience, including 5 in Bangladesh. Before joining DFDL, Shahwar was a Senior Associate at Duane Morris & Selvam LLP in Singapore specializing in M&A, restructuring, corporate finance, banking and general corporate work. Shahwar brings in depth knowledge and experience of the Bangladesh legal market having worked in Dhaka from 2002 to 2007 at, successively, Syed Ishtiaq Ahmed & Associates, Citibank and Lis & Lex. Shahwar is a graduate of Sheffield University, UK and has completed his LLM in International Finance and Banking Law from Queen Mary College, University of London. Shahwar started his career in the UK as a pupil barrister at Erskine Chambers, having qualified as a barrister. He is also qualified in Bangladesh and is a member of the Dhaka Bar Association. He speaks English and Bengali. Shahwar will bring to DFDL’s clients his significant Bangladesh expertise and capability and international expertise in, among others, mergers & acquisitions, general corporate and commercial work as well as international arbitration. Shahwar will play a key role in developing DFDL Bangladesh expertise, extending the reach of the firm further beyond the Mekong region. This high profile hire in Singapore comes in the wake of DFDL’s successes to attract high caliber professionals in Cambodia (former PwC tax partner Jean Loi, senior PwC Tax Lawyer Clint O’Connell), in Lao (former EY tax specialist Jack Sheehan) and in Thailand (former Herbert Smith’s Head of Corporate & Commercial Mr Rashane Leerabandhu). These developments highlight the strategic potential of the firm far beyond the Mekong Region while at the same time remaining true to our pioneering spirit and strive for professional excellence.